A detail of the Sidamara Sarcophagus, on display at the Istanbul Archaeology Museum. Turkey is asking for the return of a sculpture of a head that was detached from the tomb. London (CNN) -- Turkey's government is calling on the United Kingdom to return the head of an ancient marble statue taken more than a century ago. The head was snapped off a sarcophagus excavated in Anatolia (present-day Turkey) in 1882 by a British archaeologist named Sir Charles Wilson, who then covered the tomb over again. He took the head to England and his family gave it to the museum in 1933. The tomb to which the head belongs, the 3rd century A.D. Sidamara Sarcophagus, was re-discovered in 1898 and currently resides in the Istanbul Archaeology Museum. Now, the Turkish culture ministry wants to reunify the marble head, which bears a resemblance to Eros, the Greek god of love, with the sarcophagus. They are currently in negotiations with the museum to repatriate the object. Dr. Tolga Tuyluoglu, the director of Turkey's culture and tourism office in London, said in an email: "This unique piece is not only one of the largest examples of its kind in the world, but it is truly a work of art, featuring magnificent detailed reliefs." "It is important that the Eros head is reunited with the rest of the Sarcophagus," he continued. 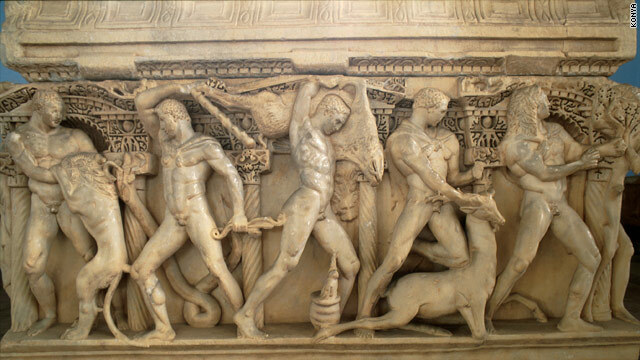 It's a situation with echoes of the famous case of the so-called "Elgin Marbles," friezes which were removed from the Parthenon in Athens by the 7th Earl of Elgin in the 19th century and taken to England. Now displayed at the British Museum in London, the friezes are a matter of dispute between the governments of the UK and Greece, with the latter calling for their return. Though this long-running debate has failed to produce favorable results for the Greek government, the Turkish culture ministry is hopeful that the V&A will heed its request. Tuyluoglu said: "The Ministry has a good relationship with the V&A Museum and we are hopeful that an agreement between the two parties can soon be reached." Olivia Colling of the Victoria & Albert museum, said that "amicable" negotiations with the Turkish government were taking place and stressed that the return of the sculpture was "not a closed door." If the museum does decide to repatriate the object, it will be as a sign of good will, according to Tim Schadla-Hall, a Reader in Public Archaeology at the Institute of Archaeology at University College London. That's because the object was removed from Anatolia long before UNESCO's 1970 Convention on the Means of Prohibiting and Preventing the Illicit Import, Export and Transfer of Ownership of Cultural Property, he said. The convention requires signatories to prevent the theft of cultural objects, but also to recover and return stolen cultural property. The Turkish government has made no allegation of theft. "Legally, there is no basis for return, they wouldn't be able to get it back under any convention," he said. And Sir Charles Wilson, who was Britain's consul-general in Anatolia at the time, may well have had a license for his excavation, said Hall. The marble head has not been on display at the V&A for some time. If it were to be sent back to Turkey, it would be reunited with the sarcophagus and put on display in the Istanbul Archaeology Museum, said Tuyluoglu.